I was just wondering if you still use this supplement today and experience the same effects on ME/CFS, that you were mentioning in your post from before, from Tribulus terrestris? I’m diagnosed with ME/CFS myself since long ago, and tried a supplement that helped me live a normal life - which I found out today also contained this Tribulus terrestris. That supplement I ate was unfortunately banned from production in my country and shortly thereafter I fell back into the chronic fatigue almost exactly as I’ve had before. I’m now trying to ascertain just what exactly helped me get better. I’m still struggling with ME/CFS. Hope you can get back to me! Apologies for the (very) late response to your comment. 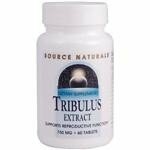 Yes, I do still use Tribulus terrestris and derive the same benefits as when I wrote my initial review. I find it particularly effective when struggling with liver and gut-related issues. It's been shown to increase glutathione in the liver and hence improve detox potential so it's a great supplement to take in these circumstances. If I am suffering from sore/inflamed intestines I usually take one or two 750mg tablets and the next day that inflammation has died down significantly. Regarding the other benefits. Tribulus works to balance stress hormones so it's also a good supplement to increase a general sense of wellbeing and energy. Obviously these are crucial to dealing with ME/CFS and I find it one of the best supplements in my "armory" simply for feeling better in general. I can't say the effects have worn off over time either so it's definitely worth taking on a long-term basis and as far as supplements go it's relatively affordable. I'd certainly recommend it for ME/CFS, stress/anxiety and promoting a sense of wellbeing and energy - as well as the gut-related benefits I mentioned which more often than not go along with ME/CFS. Hope this helps and you get as much benefit as I have from this fantastic all-round herbal remedy.